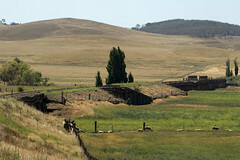 The Cooma Monaro Railway can trace it’s origin back to 1992, when a group of Cooma residents sought to restore the station building, the condition of which had slowly deteriorated since the lines closure south of Queanbeyan in 1986. When the station restoration was completed, the same group then investigated the idea of running trains on the line, as a tourist railway. When a number of CPH Railmotors were offered for sale, and bought by the society, and brought to the site from 1994 onwards. By 1998, two motors and one trailer had been restored to (as good as) new, and were ready to run on the line to Snowy Junction on the grand opening in December, 1998. 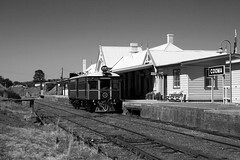 CPH6 at Cooma Station. 26/1/09. The line to Cooma was opened in 1889, with the line beyond to Bombala open by 1921. Also in 1921, the current signal box on the platform was constructed, although the interlocking machine in the box is thought to have replaced the original machine in 1926. Initially, the construction of the line brought many tourists from Sydney, as the railway line provided easy access to the snowfields, as well as other tourist destinations in the region. Most travelled to Cooma on the “Cooma Mail”, which, in 1933 departed all days bar Saturday from Sydney Terminal at 20:40. The train was hauled by a member of the 35 or 36 class as far as Goulburn, where the train would arrive at 01:35 the following morning. The loco would be removed and dispatched to Goulburn Loco to await its next turn of duty, and would be replaced by a 32 Class for the run south to Cooma. Departing Goulburn at 01:50, the mail would arrive in Queanbeyan at 04:01, for a twelve minute stop to unload mail and passengers for Canberra. The mail would then continue on to Cooma, where it would arrive at 06:52, to be shunted to form a mixed service to Bombala, departing at 07:12. The return journey would depart Cooma at 21:26 the same evening, to arrive Goulburn at 23:45, to replace the 32 Class with a 35/36 Class, before finally arriving back into Sydney Terminal at 04:50 the next morning. During the 1950’s, with the construction of the Snowy Mountains Hyrdo Scheme brought a great deal of traffic to Cooma, with the yard always occupied by plenty of wagons and locomotives, with labourers and equipment coming in daily by rail. By the 1960’s, the amount of freight being railed to Cooma reduced, with most of the major construction works completed, combined with a slow shift of freight to road haulage. This would prove to be the beginning of the end for the railway line, which was finally closed on the 29th of May, 1989 – just one day after celebrating it’s 100th year of rail service to Cooma. 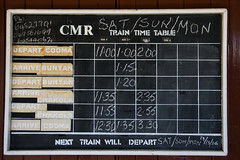 CMR Timetable at Cooma Station. 26/1/09. Currently, the society runs 17.5km to Chakola. Despite the line having not been used for nearly a decade at the time of the first official train to run on the line (December 1998), the society inherited the line in decent condition. Shortly before the closure of the line, the then SRA relaid the line with 90lb rails, and replaced a large number of sleepers along the line with timber sleepers in good condition. This meant that, for the society, very little work was needed to be done in the way of trackwork before running their first train. For most of the year (October to June) the society runs three trains a day on both Saturdays and Sundays (as well as public holidays), while in the remaining months of the year they run two trains a day on Sundays. Services either run to Bunyan or all the way along the line to Chakola. There are two safeworking sections on the line, one between Cooma and Bunyan (which itself is a two platform station complete with through road and dock platform), and one from Bunyan to Chakola. This enables the society, during busy days or when private charters requite it, to run both railmotors. One runs a shuttle from Cooma to Bunyan and enters the siding, while the other railmotor runs from Chakola to Bunyan to collect the staff, and on to Cooma before returning. During race days at the nearby Cooma Racecourse, the society operates shuttles from Cooma Station to Snowy Junction (once the site of the junction to the nearby Snowy Mountains Sidings), and return. The line crosses two level crossings in Cooma, and despite the appropriate signage and protection being in place, a volunteer is still required to attend both level crossings when a train is due, to stop traffic and advise the approaching train that the crossing is clear of traffic. Railway Digest – May 2008 – ARHS NSW. just check your tag on the Tulloch plate …. I dont think it is on a 38 class ?? Very much enjoyed reading your history of the Cooma Chakola restoration. All the best.